The beautiful scenery of Xinjiang is the place you want in your life. There are magnificent natural landscapes, the “exotic” ethnic minorities with their unique customs, as well as the great ruins of significant historical cities along the silk road. During this tour, we will visit the highlights of Kashgar, Urumqi and Turpan cities, as well as exlporing the famous Karakul Lake and Heavenly Lake. Witness the great ruins of significant historical cities. Enjoy the beautiful Karakul Lake and Heavenly Lake. Visit the highlights of Kashgar, Turpan, and Urumqi cities. Upon you arrival, met by our tour guide and escorted to your hotel. The rest of the day is free for you to explore this city. Morning head to view the fantastic scenery of Karakul Lake. It is the highest lake of the Pamir Plateau. Enjoy the crystal water, the peaks and blue sky, and also the creatures here. After the tour, drive back to Kashgar for overnight. At last, visit Kashgar Old Town, a major stop along the Silk Road, where is full of Uygur style folk residences. Today take a morning flight to Urumqi. Upon arrival, tour guide will pick you up and transfer to hotel for a short rest. Then head to Xinjiang Museum for a visit. A visit to Xinjiang’s capital of Urumqi would be incomplete without a visit to the Xinjiang Museum. It is a comprehensive historical museum in China built in 1953, and famous for holding artifacts and mummies of Caucasians who lived in the region 1500 and 4000 years ago. 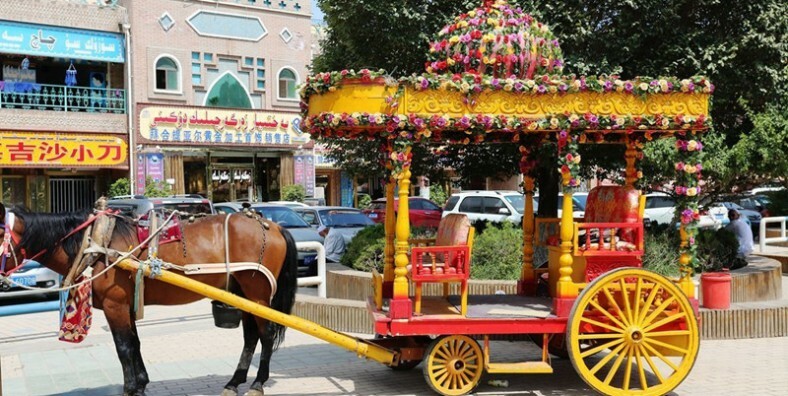 Afterwards continue the trip to International Bazaar, one of the most famous landmarks in Urumqi city, which is the largest bazaar in the world by scale, combining Islamic culture, architecture, ethnic commerce, tourism and entertainment. Morning, drive to Turpan. After arrival, head to visit Jiaohe Ruins. It is a natural fortress located atop a steep cliff on a leaf-shaped plateau between two deep river valleys. Then move on to Karez Well System. Located in the Turpan Depression, it is a vertical tunnel system adapted by the Turpan people. After that, continue the tour to Sugong Minaret. At 44 meters high, it is the tallest minaret in China. Afterwards visit a local Uyger family with vineyard, and experience their local lfestyle. Today visit Bezklik Grottoes first, a complex of Buddhist cave grottos. Then move on to Astana Graves, an underground cemetery of ancient Gaochang residents, which is considered to be one of the humblest burial sites in China. After that, head to visit Tuyoq Valley, splitting the grand Flaming Mountain into two parts, which is a gorgeous valley with a long history, splendid culture and charming natural scenery. Then drive back to Urumqi. Breakfast at hotel and then head to Heavenly Lake, 98km northeast of Urumqi downtown. It is a crescent alpine lake in the north of Bogda Peak, which enjoys crystal water due to melted snow as its source. Cruise on the lake and stroll around the lake after that. Stay overnight in the Kazak Yurt. Enjoy the morning of Heavenly Lake and drive back to Urumqi in the afternoon. Transferred to the airport or train stataion for your next destination.